Welcome to Day Four of The Escapist's Indie Developer Showcase, a 10-day celebration of the designers and programmers who have struck out on their own to make the games they want to make. Each day we'll feature a new game or demo by an up-and-coming indie developer along with a brief interview. Some games are already commercially available, some are works in progress, but all are free to play. To see who's on the schedule or check out what you've missed, click here. Enjoy! Sean "th15" Chan is a 23-year-old game designer from Singapore who started his career making Warcraft 3 maps and eventually moved on to making games in Game Maker. 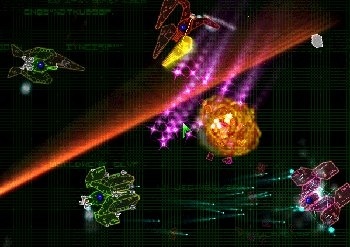 His current project is Battleships Forever, a freeware space combat sim featuring fully customizable user-created ships. "Battleships Forever is a tactical real-time strategy game that features spaceship combat where each individual ship section and gun turret is modeled to meticulous detail. What this means is that you can blow off parts of ships realistically instead of having ships magically explode when their health bar hits zero." "On top of that, the game comes with an extensive Ship Maker program that allows you to create your own ships. This allows you to setup your own fantasy space battles, just like when you were younger and playing with spaceship toys, but with more pew pew and better explosions." "Lately, I've been working with some of the guys who play Battleships Forever to release a major new version of the game. Thomas "Kaelis" Gawarski has added a whole bunch of spectacular features to the Ship Maker such as rotating and transforming sections and custom sprites. Others such as Arcalane and Cycerin have also been very helpful in putting stuff together for Battleships Forever." "Coding everything so that it works properly. That's definitely been the most difficult and the most rewarding part of making games. I'm not a programmer by training (I did TV production in school) so I had to learn how to code along the way. That said though, the satisfaction of having written code that works smoothly is pretty cool." "I was still in school when I started working on Battleships Forever. But we have conscription over here in Singapore, a mandatory two years of service in the armed forces. I worked on Battleships Forever through this two year period on the weekends and evenings off. That was pretty terrible." "Their commitment to making really cool games. I am working full time with a small dev here in Singapore right now, but I try to work on and release games during holiday periods. I just want to make good games; whether I do that as an employee or independently doesn't matter to me." "Remembering that the most important part of a game is the player. Too often designers indulge themselves in self-serving whims such as trying to make a movie instead of a game. Cinematics are just silly - cut scenes nullify the agency of the player and they're the ones that count. It's saddening to see videogame designers trying their hand at amateur movie making within their games and doing such a mediocre job of it. Our medium has its strengths and weaknesses; it makes no sense to try to make a movie when you're making a game."